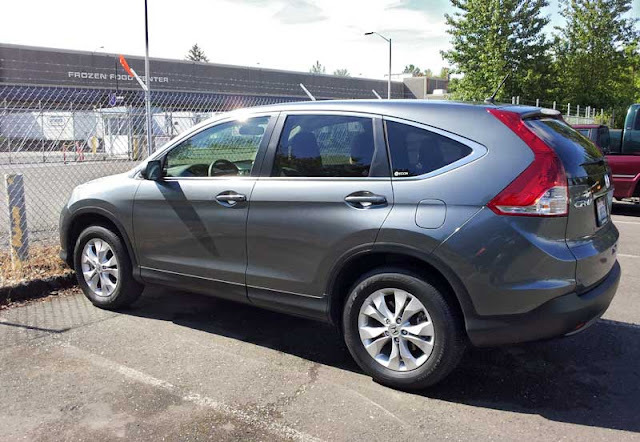 In the driveway this week is the 2012 Honda CR-V EX. This AWD compact crossover represents the first new newly designed CR-V since 2007. I've always been a fan of Honda's cute ute, and this one will likely keep me a fan. Unlike some of the other Hondas in the lineup, such as the Civic and Accord, the CR-V seems to have stuck with what has always worked for Honda. Things such as simple, effective, clean designs in both the interior and exterior, for example. Nothing too crazy or over-the-top, this crossover is what I liked about Honda in the 1980s and 1990s; it's a minimalist, functionalist, modern design that works. Some may call it bland, but it's very effective. Since I'm not much of a fan of Honda styling and interiors as of late (sans the Fit), I was delightfully surprised by the '12 CR-V. In addition, the ride is smooth and comfortable; acceleration is surprisingly good; interior space is voluminous with lots of cubby holes for stuff. So far, there haven't been any confusing dash bits, awkward interfaces, or major negatives. We'll see if that trend continues as we put some more miles on the vehicle. Stay tuned.